The Tate-LaBianca Homicide Research Blog: "Bigger than the Beatles"
I hope I'm not "double dipping". If this has been presented before I don't remember it. The video is interesting, although inaccurate in dealing with the Manson inference. Last year, a long-in-the-works biopic about Dennis Wilson was put on hold, but a creepy chapter in the late Beach Boys drummer's life will be coming to the silver screen in the form of the upcoming film Bigger Than the Beatles. The flick depicts the connection between Wilson and notorious criminal Charles Manson. In the late '60s, Wilson became associated with Manson and his infamous Family, and he helped Manson to make some headway in the music industry. This happened the year before the murders of 1969. The story of Dennis Wilson of the Beach Boys and how he found an intense singer/songwriter who he introduced to Hollywood. This musician was sure that one day he's be a household name. That musician did find fame, but not for his music... because that musician was Charles Manson. The film is set to star Joseph Andrew Schneider as Wilson and Douglas Bennett as Manson. It's due out on February 10, according to IMDB. The Dennis and Charlie story was previously touched on in the 2000 TV movie Beach Boys: An American Family. Thanx for the post, this film looks like it might be "interesting", but I don't expect it is an "historically accurate" depiction. I'm not sure, but I don't think "Leghorn" (Jenifer Gentry) was with Manson when they were at Dennis Wilson's. I've read she didn't join until after the Barker arrests. She was certainly there by the time of the Hendrickson films, but I don't think he started filming until just after the Barker raids. I don't know if Candice Bergen ever met Manson or was present at any of the recordings, I haven't read Bergen's book. I suppose it's possible though. Sunset, the film is interesting, but not accurate. At least not totally. I read Candice's book and she never met Manson at a recording session. Also, as far as I know, Manson didn't introduce Tex to Dennis. Tex met Manson at Dennis' house when he went there after meeting Dennis hitchhiking. Also, as we all know, Squeaky didn't have a long brown hair. Hey wouldn't it be great if Brian Davis could get Candice on SCR for an interview! Now that would ROCK! This is the movie trailer - it doesn't mention or feature the murders at all, the movie is primarily about the music and what happened before the murders. 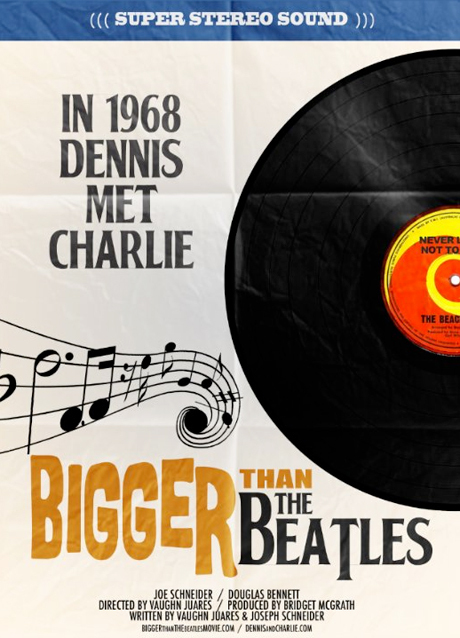 This is the trailer to the "Bigger Than the Beatles" movie. It's all about the music and doesn't address the murders. That what you call "poetic licence" which basically means "a distortion to fit the director's agenda !"